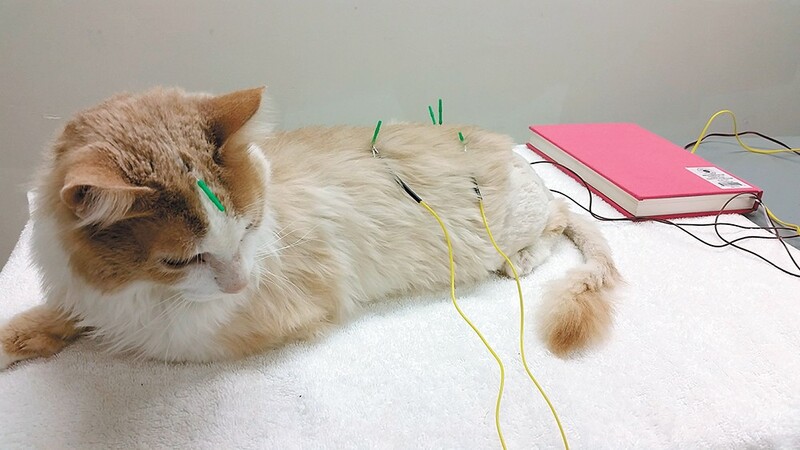 Veterinarian Jessica Bunch was comfortable using acupuncture on her own cat, pictured here. He used acupuncture, which involves stimulating certain parts of the body with needles. In recent years, he's used cannabidiol, or CBD oil. He's encouraged pet owners to stick their pets on raw food diets. Thomas has since retired from his practice as of April. For Thomas, these are not just tools for treating pets outside of traditional Western medicine. Chinese medicine, he says, is a whole new mindset. Whether or not other veterinarians see it the same way, many are starting to recognize that some alternative methods do work — at the least, in a supplementary way to conventional medicine. Donna Troyer, a veterinarian who's been doing acupuncture for pets in Spokane for three years, says acupuncture can treat a variety of ailments, but works best for pets who are old and in pain or who have dementia. It won't cure cancer, but it can help extend the pet's life or make them more comfortable. Jessica Bunch, a Washington State University veterinary medicine service coordinator, says acupuncture is the most-used "alternative" treatment used by WSU. She's even used it for her own pets. The original print version of this article was headlined "What's the Alternative?"